How to Find Out If a Web Browser Is Secure Enough For You? UPDATE 2018: Find out which is the most secure browser for 2018 – have a look at our extensive research! What Threats Exist Out There? Furthermore, bear in mind that there will be no specific ranking classification as every browser differs in features. The browsers will be ordered purely by market share, starting with the browser that has the biggest market share, going with browsers that have fewer shares than the previously stated one, reaching the bottom with the one with the least shares. Microsoft has been pushing their Windows 10 operating service hard since it came out. The company keeps advertising it as the safest and most secure system among other Windows versions, while also stating how Edge is faster and more secure than Internet Explorer. As the support for Internet Explorer has been cut off in January of last year, for each of its versions except the 11th one, there is no wonder that the browser suffered an exceptionally high decrease in its user base. Interestingly enough, the browser is keeping second place in the World with its market share of 19.17%, albeit the huge drop. The update schedule of Internet Explorer has certainly not improved, as updates being exactly on a 30 day basis are a thing of the past. The updates are fewer than ever and can come bundled with adverts for the newer OS of Microsoft. You can add extensions to a blacklist for sites that are known to be malicious or others, to add another layer of security. 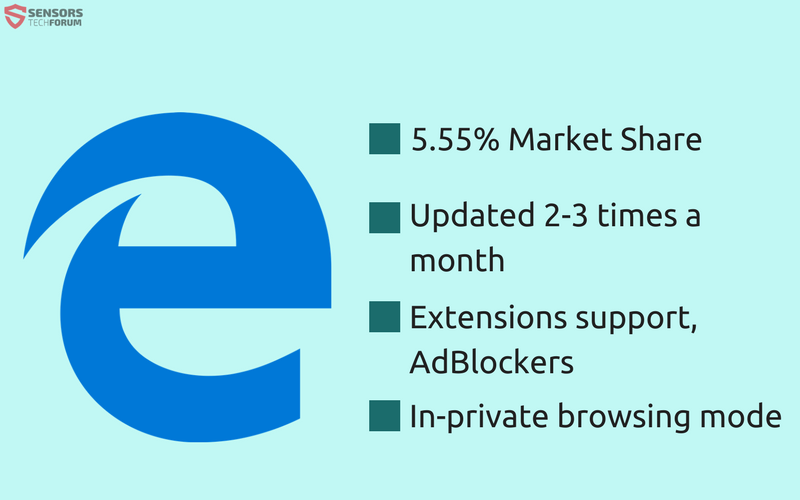 The international market share for Microsoft Edge shows an increase since the last few months and now stands at 5.55%. That is only natural as the company wanted to make that happen. Microsoft’s focus on updates has shifted from Internet Explorer to Edge. Although the updates are still inconsistent, there can be up to three updates per month. In August of last year, the official stable release for the browser included extension support. Extensions are now available via the Windows store, and for instance, an ad-blocker can be added to enhance the security level of the Edge browser. InPrivate browsing mode is fully functional and promises that no information of your browsing sessions to be saved on your computer. Mozilla Firefox has changed for the better in the past year. With a market share of 11.68% the browser wins the bronze spot in the ladder. The update schedule is shared on the blog of the browser. Around two months can pass between major version releases, but a more frequent update scheme is being kept for minor updates of one version. In that way, there can be a new update in just a few days. The browser has an in-built security protocol for checking websites for forgery and phishing. All test versions of Firefox are ahead of it, and if you want “nightly” updates as they come out, you should get the Nightly build. Mozilla Firefox’s Private browsing mode includes tracking protection. You can put various add-ons on the browser as it doesn’t have in-built ones, but there are plenty to choose from, to suit all your privacy needs, including ad-blockers and the like. 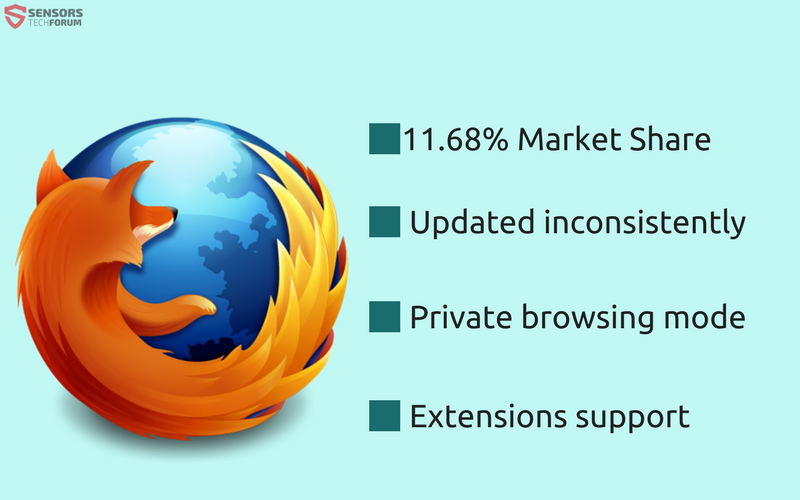 Firefox is preferred by many people, due to its high accessibility and diversity. Safari, the favorite browser of many Mac users, is at 3.45% of the global market share, which is not a surprise, considering that Apple discontinued Safari for the Windows operating system, which is the predominant OS. Also, most people seem to prefer to use other browsers. The standard update period for Safari is 54 days. 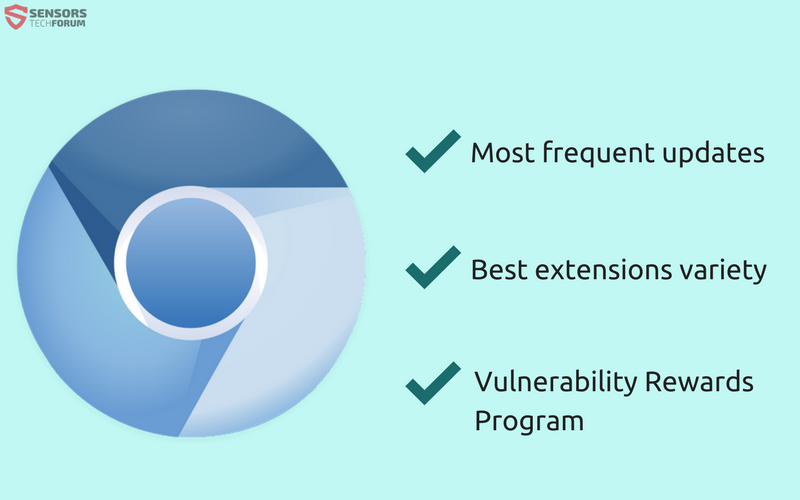 A lot less vulnerabilities are found in this browser compared to other popular ones, thus the update time makes sense. Apple, being a strong supporter for privacy and security, has added extensions like 1Password and DuckDuckGo to the latest edition of Safari. The browser continues to have a private browsing mode, protection from harmful sites including sandboxing, and third-party cookie blocking as before. The Opera browser is with a 1.22% market share, and although not widely used, it makes for a very highly customizable security browser application. A free built-in VPN will make your browsing experience safer. The extensions gallery is more diverse than ever, while offering HTTPS Everywhere, Disconnect, Avira Browser Safety and a multitude of AdBlockers, including one for Facebook. Updates come every 48 days as before, but this browser is not the target of many attacks, so that is a good balance. Opera now offers fraud and malware protection and even blocks insecure content like scripts and plug-ins, even if they are run on a trusted web page. All of the above make great points to consider Opera as a secure browsing solution. 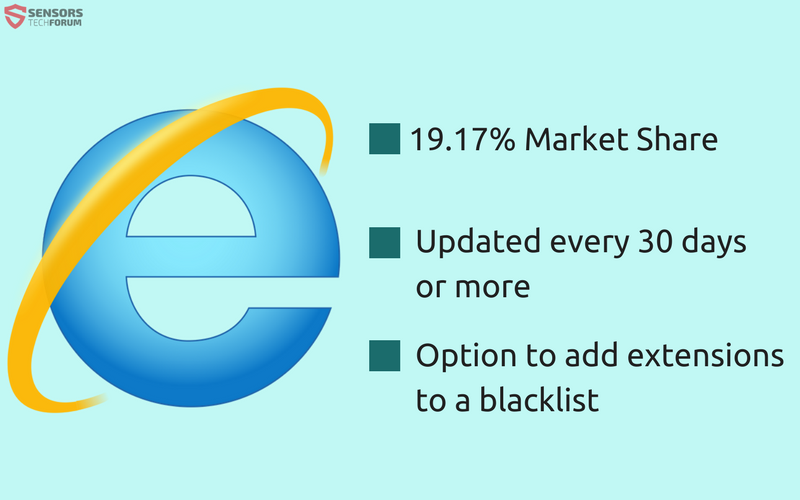 The rest of the browsers used in the world hold a total of 0.40% market shares. The following browsers are honorable mentions, which deserve a place in the article. Comodo Group, Inc. which is a leader in cyber security solutions, and a famous issuer of SSL certificates is also the developer of two browsers based on security. One of them is the “Comodo Dragon” which is a fork of Google Chrome and the other – “Comodo IceDragon” that is a fork of Mozilla Firefox. Being formed from popular browsers, the Comodo Dragons follow the update schedules for the corresponding browsers they are based on. Although their interface is an exact copy of the original, their security features are not. Comodo Dragon performs extra checks on a site’s SSL digital certificates, has an on-demand site inspector that checks for malicious activity and even blocks features that are in-built in Chrome, such as Google’s user tracking, PDF viewer and Adobe’s Flash Player, automatic address bar search suggestions, Google Safe browsing etc. Unfortunately, Comodo does tracking of its own, so it is not 100% private. Epic, known by its other name “Epic Privacy Browser” is focused entirely on privacy. Due to the browser being based on Chromium, its updates are delivered within that 15-day time frame just like Google Chrome. The aim for Epic browser is to limit extensions to the maximum, because of their tracking capabilities. Epic browser, with its inherent blocking features, claims that you will not be tracked even by your government and you will not see any advertisements no matter on what website you are on. Those features are the removal of DNS and Web cache, blocking URL check or URL tracking, disabling error reporting and the RLZ-Tracking number. No suggestions and no auto-filling options are available either. The most notable of all options you get with the Epic browser is its one-click encrypted proxy, which will give you real anonymity online. Avira Scout is running strong, keeping its update schedule around the 15-day mark, since it is based on Chromium. Since the past year, the browser is out of its beta testing period and already has support for more extensions, tools, plugins etc. As its implementation of the database for Avira Anti-Virus, the browser is presented to offer a more updated protection against all kinds of online threats. HTTPS Everywhere and Privacy Badger are inside the browser’s code, but not enabled by default. A selection of different ad-blockers is available and can be added, as well. The browser continues its pursuit to block the tracking features of websites and social networks like Facebook. An important thing to consider is that not every browser updates automatically, and that you should always update the browser applications that you are using – you can do a check from the following website. We cannot say exactly which browser is the most secure for 2017, but we would definitely recommend Chrome or one that is based on the Chromium project, especially for users that are not tech-savvy. Google also hosts a Vulnerability Rewards Program which encourages independent researchers to report bugs. Don’t be in a hurry to leave! We’ve got more useful reads to offer! You mention that Chrome uses sandboxing, but you don’t mention that Edge (and Opera) does the same. Edge is a Windows application, so it uses the sandbox environment of Windows. Chrome sandboxes every tab, and Opera as well, since it started using code from the Chromium project. So you are right, but Chrome as a browser alone uses a unique sandboxing feature. Imbecile. Are we to understand that Chrome uses a sandbox feature that somehow isn’t available to the developers that use the Chrome and Chromium CODE BASE to build their application?? I suppose Tor Browser can’t access the security features built in to Firefox because it uses Firefox as its code base? “We cannot say exactly which browser is the most secure for 2017, but we would definitely recommend Chrome or one that is based on the Chromium project”. 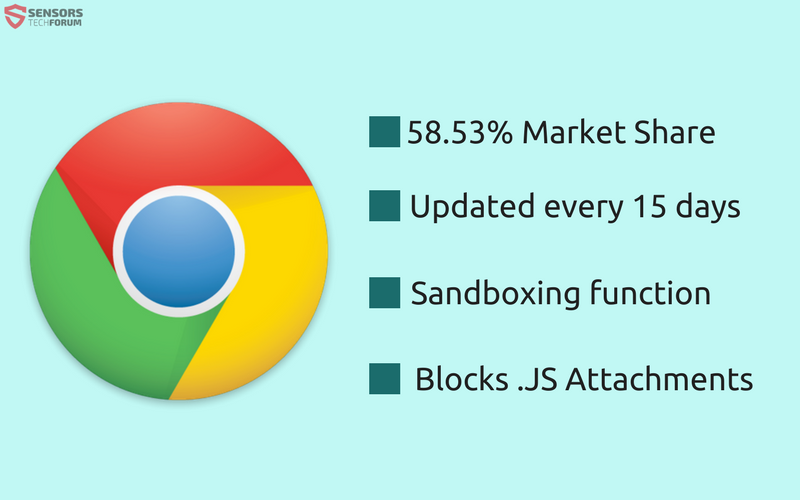 Google with their Chromium project are the Original source of that sandboxing feature, and that’s why we give their browser the biggest credit for that – everybody knows that a browser that shares the source code, will also have that sandboxing feature. Well, you still fail utterly and completely. A chinese cooperative recently bought Opera with the full intent of data mining Americans using the same methods that Google does in Chrome, and they will certainly employ other tactics which most people would call illegal. I’ve turned off updates for all of my Opera products, I’m uninstalling them and I would certainly never install it on a new device from a fresh download. ..or advise anyone else to do so. While I can’t agree with Drakonious’ lack of courtesy or professionalism, he makes very valid points. This article fails to address any issues that truly need to be addressed when evaluating a secure browser. As a cyber security professional I recommend forgetting this article and conducting further research. Especially into epic privacy browser, but make your own decision based on valid research and not this malarkey. features that are in-built in Chrome, such as Google’s user tracking, PDF viewer and Adobe’s Flash Player, automatic address bar search suggestions, Google Safe browsing etc. You also failed to mention that Chrome recently buried the view certificate button for SSL certificates under developer, security. ..but you go ahead and recommends Chrome anyway?? The arabs have a term for that, infidel. Someone who knowingly passes on bad information. If Firefox has cleaned up their code base, I’m moving back to Firefox. So, thanks for that snippet of intel. The rest of the article is hogwash. You don’t even mention the Tor Browser or which add-ons to trust to add in to which browsers to actually fully protect your privacy. The article is about the basic features that come with the default installation of the browsers. Everybody has very specific preferences, and we can’t tell people what to add. Plus, fully protecting your privacy is impossible in this day and age, since the information will always go somewhere, and you can’t know for sure if it is going be used somehow. We weren’t aware of Chrome burying that certificate button – could you please provide a source to prove that statement? A source?? It’s a known fact. Click on the padlock, it’s got a stupid feature type listing like Flash does. Google it yourself, that’s how I had to learn it. Google has released a statement that the function was intended for Developers and not the end-user. So, the button is not gone, but just moved. For quick access, press Ctrl+Shift+i (which will open the Developer Tools), then choose the “Security” Tab and finally click on “View Certificate”. Not Google’s decision, I’m afraid. The feature has been there since Internet Exploder 3.0, If I recall correctly. Every browser since has adopted the same behavior to keep from confusing end users and promote internet security. The only reason to BURY the feature would be to confuse end users and hinder internet security. UR is a fast and secure web browser that gives users the tools they need to protect their data online. With built-in privacy and security features, such as an ad blocker and a set of privacy tools that block many types of tracking, users can easily protect themselves online with minimal effort. Based in France, UR is the European alternative! Hey !, I found this information for you: "Which Is the Most Secure Browser for 2017 – Firefox, Chrome, Internet Explorer, Safari". Here is the website link: https://sensorstechforum.com/the-most-secure-browser-2017-firefox-chrome-internet-explorer-safari/. Thank you.